Colorado is seeing a big change in the real estate landscape and here in Colorado Springs, we are no exception to the rule. As the prices of homes skyrocket we are seeing more and more people upgrade their older homes instead of buying a new one and we are seeing more older home being flipped than ever before. This includes historical homes. While the process of restoring historical homes is definitely rewarding, it is also something that comes with its own set of problems. One issue renovators face is deciding what to do about old windows. They are hugely inefficient and drafty but, replacing them is expensive and takes away that character that makes these homes so special. Also, removal could damage the surrounding architecture, which will impact the value of the property. However, leaving in old windows most assuredly means drafts and high utility bills. At Greenlight Window Films we have the solution historical home renovators are looking for in regards to the old hard to renovate windows. A solution which keeps the lovely old windows intact, while at the same time making them energy efficient. That answer is, surprisingly, window tinting. One of the best methods of preserving and restoring historical home windows is actually window film. Not only is it cost-effective but non-invasive as well. Brands like Llumar, Huper Optik Nano-Ceramic, 3M, and Enerlogic are just some of the big name brands used to upgrade windows instead of replacing them. The best part is–it makes old home energy efficient while preserving the authenticity of the building. Once window film is installed it dramatically lowers utility costs, provides UV protection and makes the home more sustainable. Installing compatible and energy-efficient replacement windows that match the appearance, size, design, proportion, and profile of the existing historic windows and that are also durable, repairable and recyclable when existing windows are too deteriorated to repair. Replacing missing windows with new, energy-efficient windows that are appropriate to the style of historic building and that are also durable, repairable and recyclable. Retrofitting historic windows with high-performance glazing or clear film, when possible, and only if the historic character can be maintained. Retrofitting historic steel windows and curtain-wall systems to improve thermal performance without compromising their character. Installing clear, low-emissivity (low-E) glass or film without noticeable color in historically clear windows to reduce solar heat gain. Installing film in a slightly lighter shade of the same color tint when replacing glazing panels on historically-dark-tinted windows to improve daylighting. 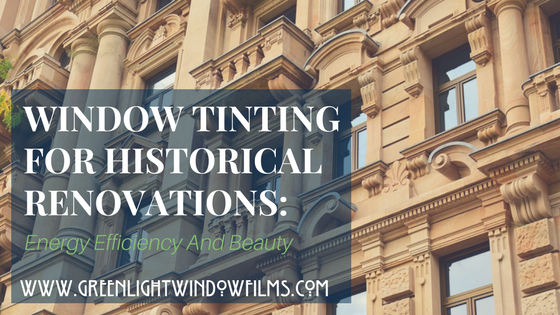 For more information about window film for historical renovations, read the renovation guide below! To find out more about window film for your Colorado Springs historic window rehabilitation, contact us at Greenlight Window Films today!